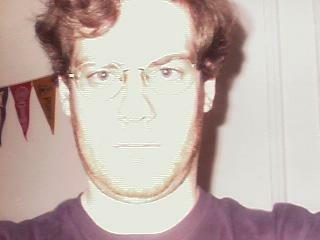 As of 12/28/2000 I have ditched the frames on this site. Nice programming exercise, bad format. Click here for my EarthLink page. It's got even less stuff, so it'll waste even less of your time. Click here for my FortuneCity page, dedicated almost exclusively to old and fun computer games. The books section of my site is undergoing a revamp(and a very possible total devamp.) So right now I have only a link to the best sci-fi picture books ever--Interplanetary Spy. And another cool series of interactive books. And hopefully an interactive book fiction page. Vogon Poetry Analysis--a brief draft of whimsical analysis I'd been planning for a while. Here's stuff about Math, but not enough to make another table out of. I loved math contests in high school and still follow them when I can--they are great for people who are too impatient to learn serious theory. Oh, by the way, here's what I look like, at 1 AM, after not shaving for a week, and feeling grouchy because my digital camera doesn't seem to want to take a picture of me. Woohoo. (Random thought to be put here later on) I still think an image or two(or a gallery page) is needed to make this site really cool--not to say other things aren't as well. Heh. What do you think? Last big update 11/24/2005(PM)--Might and Magic maps redone. 1/21/04: updated so that GeoCities wouldn't delete my account. Link to my blog. Pages usually updated when I need to put off something important to do. So far, a whopping people have visited this page since 1/8/2001. Thanks!